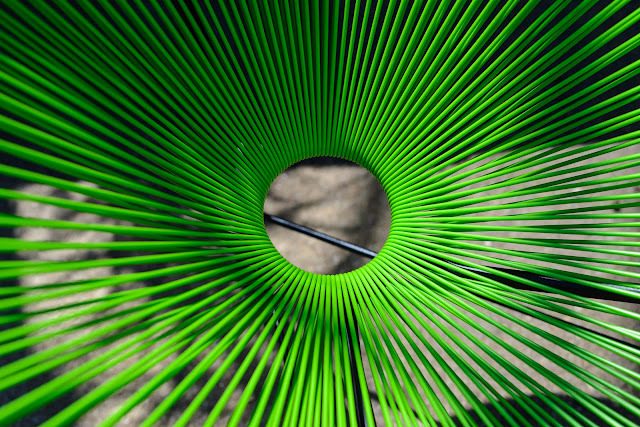 Detail of a chair observed on my walk down Lamar Blvd. in Austin, Texas. A fun and funny encounter at the bookstore. We're lucky here in Austin. We still have a big, thriving, independent bookstore. It's called, "Book People" and it sits right across Sixth Street from the Whole Foods H.Q. I love to shop there because Book People carries a lot of titles and they have an extensive magazine selection. Last week I bought a copy of American Cinematographer Magazine and a copy of Photo District News there, along with a couple boxes of cool, photo-themed greeting cards to send as "thank you" cards for client. I find something new and fun every time I step in the door. Today I stopped by on my way back to my car from the Graffiti Wall. On quiet Sunday afternoons I like to spend some time looking at all the magazine covers to see what's trending, what's current and what looks frankly passé. 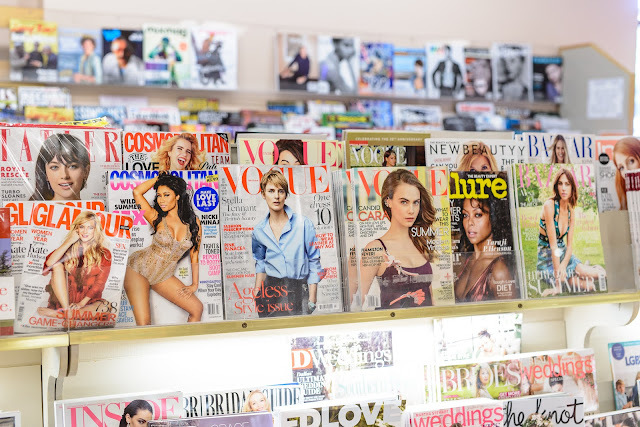 I was standing near the photo and design magazines, looking at a photo of Nick Knight on a cover, when I saw a man about my age over my left shoulder. 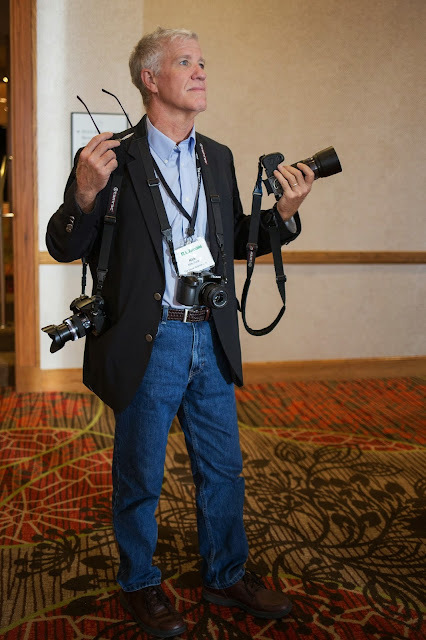 He took at look at the hulking combination of the Nikon D610 and the Sigma 50mm Art lens over said shoulder and, with a nod as a greeting, said, "I used to carry something big like that around but now I'm really enjoying a smaller, lighter Olympus camera." We got to talking and he seemed interested in educating me about the attributes of the smaller system. I mentioned that I too had several of the Olympus m4:3 cameras and liked them very much. I also mentioned that I had been writing about them for nearly five years on my blog. I identified the blog and the man broke into a smile. "You are Kirk Tuck." He said. I agreed. "Your writing is partly responsible for my migration to Olympus." We spoke for a few more minutes about the relative merits of particular lenses, and a lens acquisition strategy in general, before we shook hands and headed in our different directions. 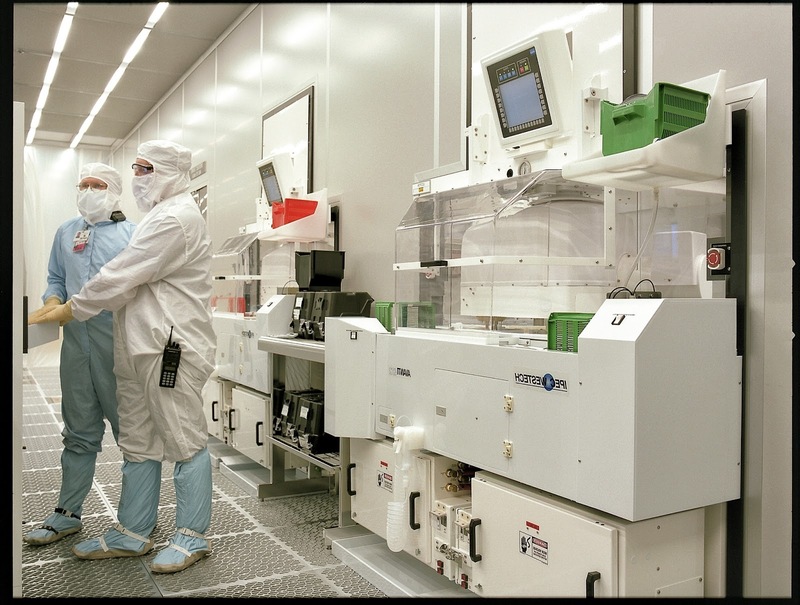 Inside the MOS 13 Clean Room. Before the turn of the century. It's pretty much official that NXP is buying/has bought Freescale Semiconductor. I'm pretty sure that after the "merger" goes through NXP will take over executive operations, rationalize all the collateral and naming under the NXP brand and Freescale, as a brand, will dissolve. It's a bit sad to see for many here in Austin. At one point Motorola, Inc. was one of the largest companies in the world and employed 150,000 people. For one reason or another (or one bad bet after the other) the company is a tiny 12,000 person remnant and long ago spun off the Semiconductor business as a separate entity. The separated semiconductor business started life as a publicly held company until the Blackstone group, the Carlyle Group and others took them private with nearly $17 billion in dept. Then, because of world economy in 2008-2011 and some changing markets, the company and their investors took some real hits but eventually took the company public again in 2011 with an underperforming IPO. Now this new merger will take the resulting company in yet another direction. Why do I care? I could trot out some tech nostalgia. I owned several very good Motorola cellphones (they invented the cellphone). I owned some very good Motorola radios (they kind of invented the portable two way radio, or walkie-talkie). And as a photographer I got to photograph a ton of very interesting stuff, including the first PowerPC chip to come out of the Somerset consortium of Apple, Motorola and IBM. It was the first RISC chip widely used in personal computers and was the bedrock of Apple's mid-era machines. From the late 1980's through to 2006 I was commissioned to do a huge spectrum of imaging work for the company. I photographed lots of products, including chip dies, chip packages and every manner of pin configuration one could imagine. I also made hundreds of portraits of senior staff across a number of divisions. I was along for the giant conferences and even photographed their educational outreach. One fun day I remember was the event where high school kids were mentored in rocket building (proto-engineering) and we all took dozens of rockets and launched them in the parking lot of Motorola/Freescale's Oakhill location parking lot. I still get asked from time to time to cover an interview with the reigning CEO or to make portraits of new, key hires but I have a feeling that we'll be starting over from scratch as more and more of the (non-engineering) staff are leaving under their own steam or being shown the door. As a photographer I grew up with Motorola and then matured in business during the Freescale years. I worked conferences all over the United States and even wrote video scripts and trade show scripts for their marketing and events department. Through the years I came to enjoy the culture. They were (and maybe still are) a company that respected family time and understood the need for balance between personal life and business. Interesting how the business landscape changes with cultural change, and the relentless march of technology. You can try to swim for it and get rolled by a rogue wave or you can get up on your board and try to ride the crest. One way or another the waves always come. Amazingly, the block buster novel of last Summer is still available to photographers everywhere. 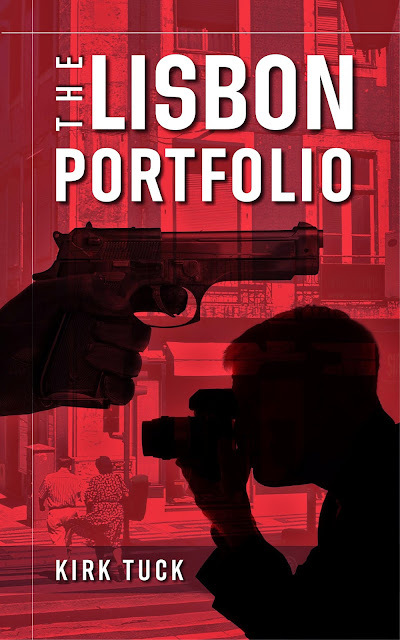 The Kindle Edition of "The Lisbon Portfolio" by Kirk Tuck. I know that thousands of my loyal VSL readers rushed out and bought my action/adventure novel the week it came out last June. One launch day alone some 750 were snapped right up, and over 5,000 people took advantage of the limited time, free book offer that happened in the Fall. But that still leaves thousands of you without the unique experience of "The Lisbon Portfolio" ownership. Sure, some of you are waiting for a copy with zero defects (sorry, artists will never achieve Six Sigma) so you can read in intellectual comfort. Others protest that this "is not the sort of stuff I read!" And others just don't read fiction at all (fiction??). But all of you who have not bought the book are misguided in thinking of this as just a more permanent and expensive alternative to the library for your casual entertainment. NO! This is a souvenir of our time together at the VSL blog site. It is the contemporaneous companion to the first 2300 delicious (and free) blog posts. It commemorates your pleasure in reading my posts and my pleasure in writing them. Many sites have a "tip jar" which allows you to leave a contribution to the sites that you value. Other writers endless flog workshops and DVDs that are priced many dozens of times higher than our Kindle edition book. But instead of thinking of the book as just reading material think of purchasing the book as a positive vote for the pleasure or knowledge you've gotten over the years reading right here on the Visual Science Lab blog. Why, in fact, dynamic range really does matter. Even if you are only working for a web audience. Nikon D610. I didn't really have a mission in mind but I'd been working on a project in the studio and I wanted a reason to go out and bake for a little while in the intense sunlight that's finally come (late in the Summer) to Austin. I had the EM5.2 on the front seat of the car (random heat testing) and after I started the engine I had second thoughts so I brought the toasty little camera into the studio and grabbed one of the Nikon 610s instead. The one with the 50mm Sigma 1.4 Art lens welded permanently on the front. I double checked on the two buzz kill parameters before I left the driveway: Does the camera currently have a (charged) battery inside? And, Does the camera currently have a memory card, with space, installed in one of the slots? If the answer is "yes" then the trip to downtown proceeds. The answer was "yes." I'm usually pretty flippant with my own, fun work. I use the cameras in the large, fine Jpeg mode a lot. It works well for lots and lots of stuff. But I'd been bouncing around a few operational ideas in my head and wondered just how much of a difference it would make if I "upped my game" and started shooting at the very high edge of this camera's potential. I set the camera to Raw, Lossless Compression, 14 bit color. I set the ISO to 100 and I set the lens aperture to f3.5 or f4.0 --- theoretically the sharpest zone for that particular lens. 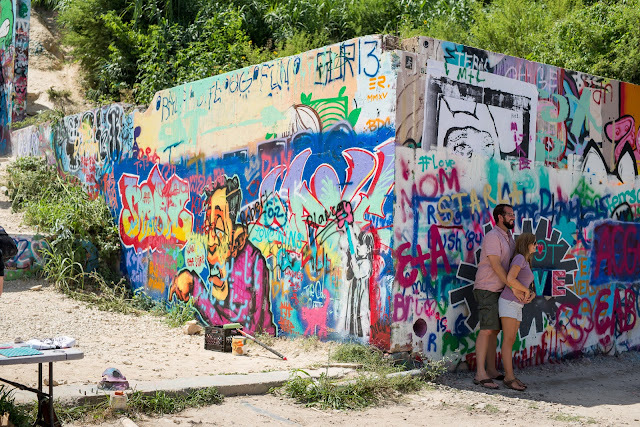 I strolled through the yellow heat of the day from my car to the Graffiti Wall a half mile away. The camera dangled over my left shoulder. I got to the wall and sat on a bench, in the shade of a line of trees that sits on the street side, east boundary of the park and watched the Sunday afternoon throng. In the middle of the bench was a man who had come to the park with his kids. They came all the way from Arlington. Their final destination was Fiesta Texas (huge amusement park) in San Antonio, Texas. My bench friend had heard about "the Wall" all the way up near Dallas and wanted to see it for himself. The kids were off spraying paint and having a blast. The father and I both agreed that every city should have a big wall that anyone can paint on. Any time. Any day. After my brief respite from the heat I got up and starting looking for photographs. I let the camera strap dangle and I hold the camera in both hands when I am walking around. My left hand around the lens and might right hand wrapped around the grip. I shot some details and then walked up to the North corner of the wall. That's what's in the image above. I looked at the scene in front of me. 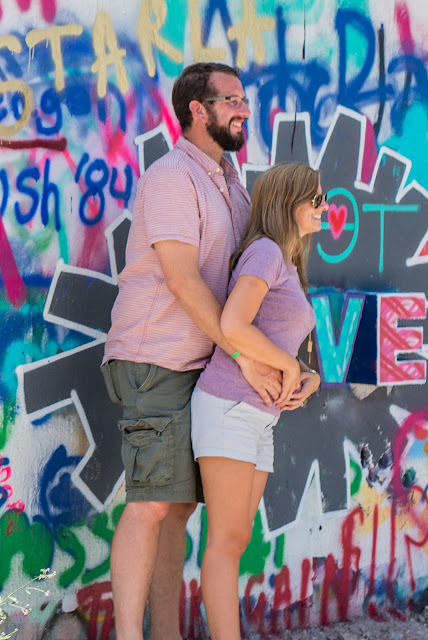 I wouldn't have tried shooting it with an older generation of camera; digital or analog, because the left hand side of the wall is in full, 3 p.m. sun while just around the corner the conjoined couple is standing in full, open shade. f16 versus f5.6? Cameras with much lower dynamic range would presumably either block up the shadow areas or blow out some highlights as I tried to straddle the two vastly different exposures. I decided to make the exposure for the sun drenched side of the frame and let the shadow side fall where ever it intended to land. This is a normal exposure with the Active D-Lighting turned off. No HDR. No special handling other than the settings I talked about above. But it is a perfectly good frame in and of itself, other than being enlarged to about 100%. What this shows me is that the ability to recover shadows had benefits in post production that are amazing. To really make a "scientific" comparison I would have had another camera, representing the "lower DR" camp, set up on exactly the same spot and I would have shot an identical frame. Well, that's not going to happen on my leisure time but my memory for camera performances is pretty good and I can't remember using a digital camera (other than a D810) that comes close to this kind of shadow recovery performance. This is one of the reasons I come back to the D610s again and again. According to DXO tests and comparisons the D610, at 100 ISO, yields 14.4 stops of DR while the D810 at ISO 64 yields an outrageous 14.8 stops of DR. The closest Canon (5Ds) comes in at 12.4 stops; two full stops less dynamic range. The D610, based entirely on raw file performance, is the 4th best camera on the DXO test grid and it's only a hair under the performance of the next three top cameras. Not bad for a camera which one could pick up, lightly used, for just $1200 as recently as a few weeks ago. While I can plainly see the results of the wide dynamic range in the initial shot at the top of this blog I can also tell you that in print, when printing to photographic printing paper, or when going into color separations, this dynamic range is a visible tool that allows you to play with the contrast and representation of your images.